If the Ministry of Tourism, Culture and Environment has its way, by 2014 Malaysia will be using Light Emitting Diode (LED) to light up its streets. By doing so, the government is expected to save RM300 million every year on energy expenses for streetlights. A typical LED streetlight, powered by solar. The ministry's initiative will be on grid power. An example of a widely use of LED lamp application bright sighboards and traffic lights. Due to its directional light beam, when angled correctly, LED lamp is very bright and suitable for traffic lightings during daytime. 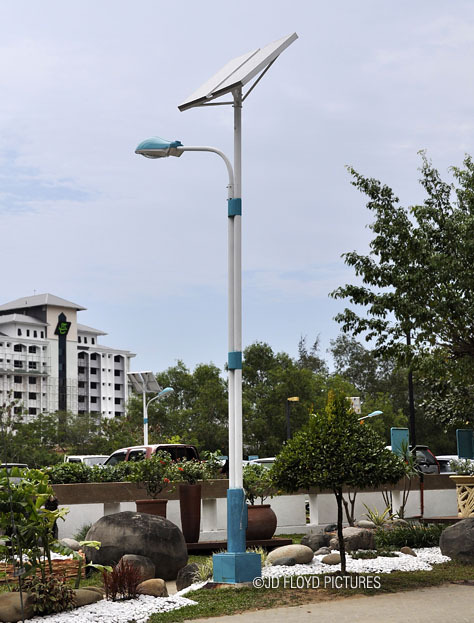 According to Assistant Tourism, Culture and Environment Minister (KePKAS), Datuk Bolkiah Hj Ismail, the move to use LED for street-lighting is to achieve a sustainable development through the adoption of green technology. It is the government's desire to look into more development plans that are environmentally friendly. Through the use of green technology via LED lights, there is an expected saving of up to 75% (I'm quoting Datuk Bolkiah) of energy compared to conventional lights. A pre-qualification registration and consulting service on the use of LED lights to contractors was held on Monday, organised by Realkey Solutions Sdn Bhd. The Federal Government is expected to roll out the budget on the installation of LED lights nationwide soon. State governments, agencies and departments may also receive a huge allocation to phase out conventional lights. To help the nation reduce carbon emission, the State Government would take the LED lights installation as one of the steps towards the adoption of green technology. At the federal level, LED lights will be installed at Ministry of Health premises and streets under the jurisdiction of the Public Works Department. 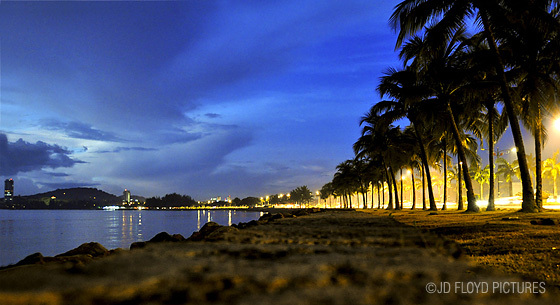 Teluk Likas street showered with LED lights? Maybe, soon. TheGreenMechanics' two cents: Massive funding, don't screw it! Do up some rough mathematical calculations and using 5 to 6 years of ROI, the total investment in the LED street lighting could cost the government a whopping RM2 billion to RM2.5 billion. But with the large number of lights to be replaced the amount should be much lesser than this. The intention is noble, so, don't screw this by turning the exercise into a national scandal. LED lighting technology is still evolving and lamp manufacturing code has not been standardised yet, unlike the conventional lights. What this means is that each manufacturer (e.g. Philips, Osram, GE, Siemens, etc) will have their own standard on fittings, rating, lifespan, build and so on, making compatibility a big issue. For instance, when you buy a Philips LED bulb c/w fitting, 6 to 7 years down the road you would want to replace a faulty 'bulb'. You can only do so using a Philips 'bulb' and not Osram's or Siemens'. If you insist on other brand, you would then need to replace the whole fitting which is a very expensive affair. In short, plan properly at the beginning and don't blow the budget halfway. I like the idea of solar street lights! @Nancy - interesting preposition but i doubt people/govt will resort to solar if the grid power is available. Such a Nice post. I also like solar lights Images. Such a great post. Really nice post all the information are really valuable and glorious thanks for sharing such a nice post.. Solar powered LED street lights are very useful to save electricity and money as well because it does not require electric power to run such street lights. Solar plates store power during day time and can be used at night. Nice post, Government is looking into more development plans that are environmentally friendly and the prioritization of such technique by industrial developers so as not to hurt the environment. In this scenario LED Street lighting is a good acceptable option. LED lighting is definitely the way to go. Get the latest news on LED Streetlight at nexusled.